This is a report thread for all the typos and grammar mistakes you may find in Fate/stay night English. Last edited by Phlebas on November 2nd, 2008, 5:44 pm, edited 1 time in total. "There no one... did you see something?" Shinji: "and some ofthe bow strings need attached"
Last edited by Alucard on November 1st, 2008, 8:01 pm, edited 3 times in total. Prologue, the end of the second day, Rin and Archer on the rooftop. If we had came here to begin with, we wouldn't have had to walk around like we have been. Theres a missing word thats suppose to be there. I repeat myself. Please do not do that again. Probably meant to be "admitting to something"? Or just "submitting", maybe. "... ask me fro confirmation..."
Last edited by uriel on November 3rd, 2008, 10:54 am, edited 3 times in total. It was his spell, used to escape that peaceful life, that gave him this pain. Most likely supposed to be unending. "...You're right, but nii-san wants me to, so I have to go,"
Should be a period, not a coma. "A park should be filled with people like families and lovers on weekends, but it's empty here now.No... this place is always desolate"
Space missing between the period and "No". And I'm STILL wondering what possible reason could there be to spell "Caladbolg" with a "K". Last edited by Ephyon on November 4th, 2008, 5:53 pm, edited 1 time in total. - There no one. Did you see something? + There's no one. Did you see something? Conversely, there should be no apostrophe here. - the girl quietly nods her lovely face. + the girl quietly nods her lovely head. I forgot where exactly where this was, but here's a screenshot. 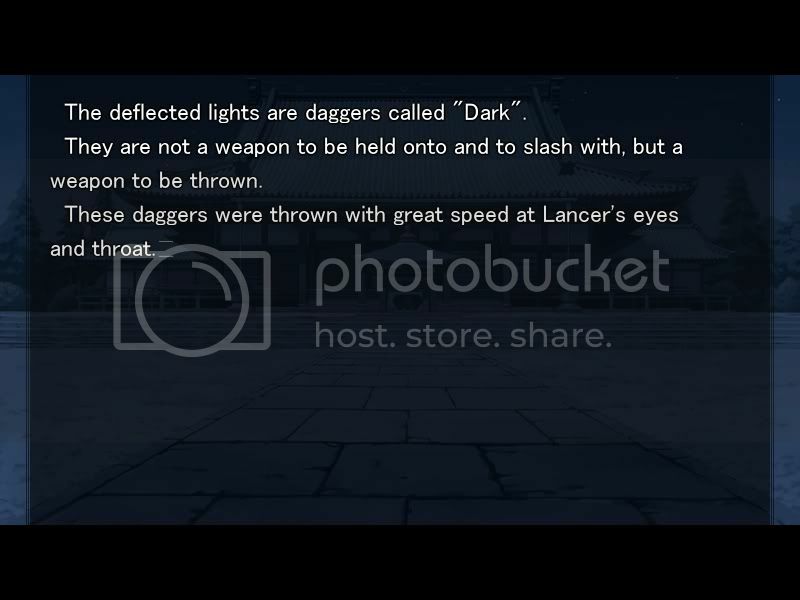 The deflected lights are daggers called "Dark". I'm not 100% sure, but these daggers are probably dirks. The scene: "7th Day: Midnight: Park - War balance randomizer". Sentence with error: "Infeted with maggots." Problem: "Infeted" is probably a typo. Correction: "Infeted" should probably be "Infested", since two sentences later is the line, "Which is infested with maggots?". A second issue, on a scene of the 9th day. Problematic sentences said by Shinji to Shirou: "It's not fair since I'm not a magus, and it's obvious that I'll win in a fight. So to be fair, I'll have her fight you." Problem: Shinji should probably be saying, "it's obvious you'll win in a fight", referring to Shirou's physically superiority. Otherwise, his comments about fairness make no sense. If Shinji claims a fight's unfair because he'd beat Shirou ("it's obvious that I'll win in a fight"), it doesn't make things more fair to have someone more powerful--Rider--fight Shirou instead. And if Shinji is saying that Shirou has an unfair advantage since Shinji's not a magus, it makes no sense for Shinji to follow up that comment with the claim like "it's obvious that I'll win in a fight". Correction: Change "it's obvious that I'll win in a fight" to "it's obvious that you'll win in a fight". A third minor issue in the scene "Intermission - Sacrilege". Sentence: "He had a common man's sense of morality, recognizing that it is correct to be good." Problem: In the sentence it looks like instead of one space there are two between "that" and "it" (something that I can't replicate in the quotation here, since the board automatically removes the extra space). Correction: Remove the extra space. Last edited by Color on November 6th, 2008, 3:24 am, edited 3 times in total. I'm playing through the UBW route and got up to Day 4. Looking through the status menu for Berserker under 'Skill', he has the 'Divinity: A' skill, which states that "As the son of Zeus, the leader of the gods....."
At this point in the game, we do not know Berserker's true identity yet. I don't know if its supposed to be there, but it clearly spoils the true identity of Berserker, which is not revealed in the status screen yet. I ran through the Fate route and during that route, we do know the true identity of Berserker when the status screen becomes available. Sorry if this was already fixed in the HF's patch; I have not patched it up to the latest yet. It might be possible that this also occurs in HF. "Whatever the other heroic spirits may be, she is an ideal swordsman who will not disobey hey master." I'm thinking that should be "her". Oh, crap. I was trying to hold it in, but I my laughter spills out. Should probably be: "but my laughter"
"...But I'm embarrassed. I never knew Sakura was a magus, and I don't know how good she is. I'm a dumbass for pretending to be her guardian all this times." Should probably be: "all this time" or possibly "all these times"
" . . . i can't hold it any longer . . . "
"I let it alone for my good, but I may have to eliminate it soon." "I let it alone for my good" seems like it could be written better. Although the "let it alone" does not seem technically incorrect, "left it alone" would probably sound better - and I figured it might have been a typo. "for my good" could probably be rephrased as well. The "f" in the"of" after he says "---Trace... On---!" overlaps with the next line's first word. Another one of those problems that could be on my end, but occurs consistently. Just for the hell of it, I'll throw another error at you that's unrelated. I have zero posts, apparently. "Never posted, how ca you read this then?" "Yup. Oh, I see. You didn't hear about it, huh? There was an incident yesterday, and some people in the track team got injured during practice. but they got injured during practice, I guess it's because of lack of sleep, so morning practices will be cancelled for a while"
The bolded phrase seems like something you forgot to erase. The scene is "Last Day: Cavern - Femme Fatale"
Sentence: "Who's outer shell is that?" Correction: "Who's" should be "Whose"--the possessive form. "The polar light destroy my eyes"
".... The holy grail borrowed Sakura's sealed id to come into this world"